Butterflies of many colors happily dancing among the pretty flowers evoke a natural softness about this free printable card. Butterflies and Flowers printable birthday card is the great choice for a floral gardener on your birthday card list. 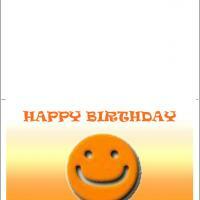 The sunny pale yellows along with a lovely printed in pink birthday greeting are a setting for a pleasant card indeed. 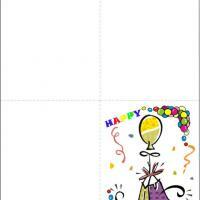 As your loved one lifts the flap and reveals the personal and custom printed birthday message scripted just for them, they are sure to have a broad smile appear on their face. They will be proud to display your card with the others they receive. These gentle looking printable birthday cards are just right for your friends and family with softer souls. 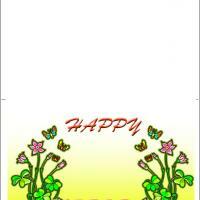 Have fun and send the Flowers and Butterflies card on to those who will appreciate their beauty the most. 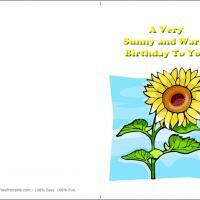 This nature themed birthday card is also shaded in soft yellow to bring the whole card together. You can add your own messages or you can even add a special photo or image right in the middle of the front. Very cute and pretty, this free printable selection is the perfect card for your girlfriends. 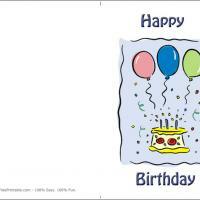 Wish them a soft and pretty birthday with this card! The flowers are blooming just in time to wish that special person a warm and fancy birthday greeting. The beautiful colored butterflies are flitting about from bloom to bloom enjoying their day in the garden. Pale yellow sunshine is streaming in to highlight the pink Happy Birthday letters. When the birthday lady receives her card she will be smiling before she even sees what you have included inside. Flowers and Butterflies free printable birthday card is easy to print at home with your personalized message printed within. You will not miss a chance to share a birthday wish when you keep some of these at hand.